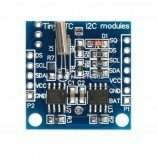 The DS1307 AT24C32 Real Time Clock Module for AVR ARM PIC Features Two wire I2C interface. Hour: Minutes: Seconds AM/PM. Day Month, Date - Year. Leap year compensation. Accurate calendar up to year 2100. DS1307 based RTC. 1Hz output pin. 56 Bytes of Non-volatile memory available to user. 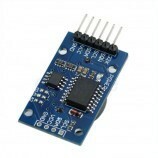 The DS1307 is accessed via the I2C protocol. Real-Time Clock (RTC) Counts Seconds, Minutes, Hours, Date of the Month, Month, Day of the week, and Year with Leap-Year Compensation Valid Upto 2100. 56-Byte, Battery-Backed, General-Purpose RAM with Unlimited Writes. 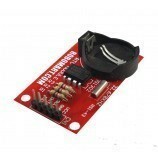 Automatic Power-Fail Detect and Switch Circuitry. 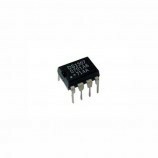 Optional Industrial Temperature Range: -40°C to +85°C. Available in 8-Pin Plastic DIP or SO. 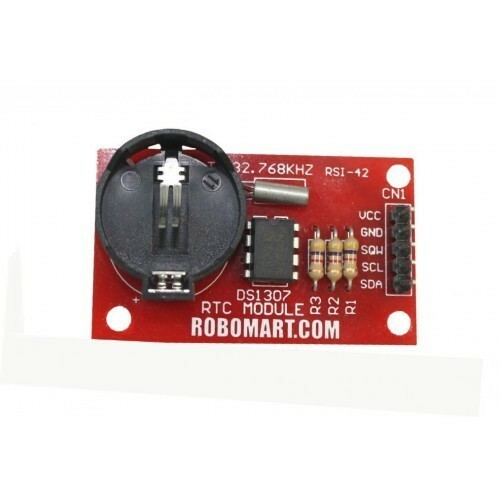 Also Searched as: arduino rtc, arduino clock module, ds1307 arduino, arduino rtc module, ds1307 arduino code, arduino uno real time clock, rtc 1307 arduino, ds3231 breakout board.